There are horse-girls who plait the hair of their My Little Ponys and trot about the playground. There are horse-women who shovel manure and tame Mustangs. I’m not one of them. 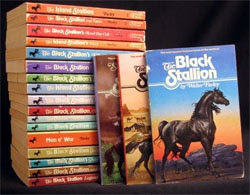 The nearest I’ve ever come to understanding this infatuation was when I raced through the Black Stallion series as a girl. 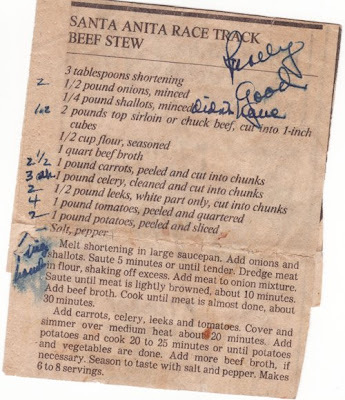 The closest I’ve come to comprehending this love as an adult is when I make Santa Anita Race Track beef stew. A race track throws together the blue-collar and the blue-blood. 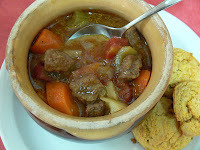 When I slice leeks and cut potatoes, I like to imagine the classy and the common savoring the same stew as the horses thunder by. (For an illustration of this, check out this clip from “My Fair Lady.”) Anyway, who can say naaaaay to a steaming bowl of equality? Clipped from a newspaper by my grandma; the notes are hers.